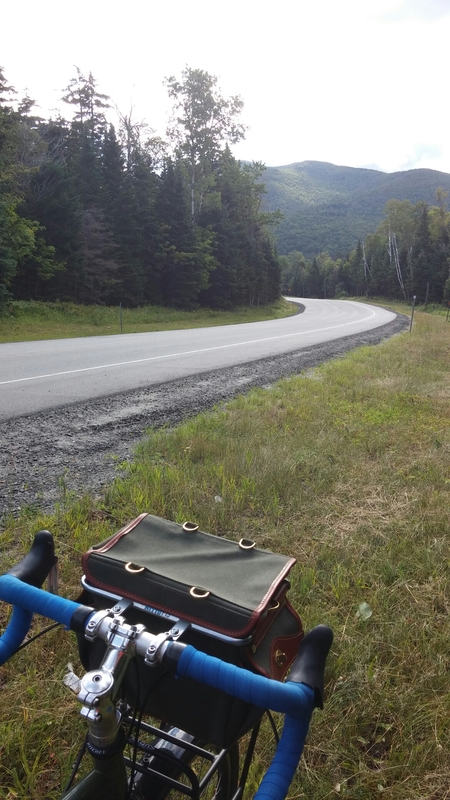 I’m back from my ten day bike tour of the Adirondacks, and here are a few things I saw, in no particular order: so many flat frogs under my wheels, the rats of the mountains; waterfalls; the old Olympic ski jump at Lake Placid; so many mountain lakes–where do they come from? ; a thousand and one RVs; so many peanut butter sandwiches; many pints and bottles and cans of craft beer from upstate New York; ponds and swamps and puddles and pools; spiders and black flies and mosquitoes, oh my; pure joy; ice dancing; campfires; craggy rocks; fields of clover; picnics; convenience stores; ice cream cones; wildflowers; homesickness; uphills that look like walls until you get closer and realize they’re just hills; hard-earned magic vistas; exhaustion; a couple of osprey sharing a fish for second breakfast; a classic car show; Vermont; coin op showers; the Hudson River; train tracks; truck drivers; deep kindness; so many shades of green; and oh so much more. And I learned so much: what goes up must come down, and vice versa; it doesn’t really matter what you eat as long as there’s something to eat; the internet can survive without you and vice versa; meeting basic needs and basic needs alone is a total vacation; take the hills as they come–not before or after; a little luxury is worth the extra weight on the bike; it’s not a race; getting lost means getting to get yourself found; some days you don’t want an ice cream cone, and on other days you’ll want two; showering is optional–take the option if it feels good; a bottle of Dr. Bronner’s is all you really need; given the option, jump in the lake; you can always make another pot of coffee; listen to your body and take breaks when it tells you it needs one; and a good general philosophy is this: Start off slow, then taper off. What a wonderful trip. Good god, I love my bicycle.